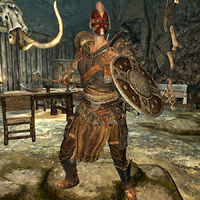 Rigel Strong-Arm is a Nord bandit, and the leader of the bandits in Pinewatch. She owns a bedroom in Pinewatch Bandit's Sanctuary. She wears a set of randomly determined heavy armor, including a pair of heavy boots, a 50% chance of a pair of heavy gauntlets, and a 50% chance of a heavy helmet. All of her armor can be up to steel plate quality at level 18. She is equipped with a leveled one-handed weapon of any type (which has a chance of being enchanted), and a leveled shield, both of which can be up to ebony quality. She also carries a steel dagger and a considerable amount of leveled gold, ranging from 50-250 gold. There are several notes scattered throughout her room indicating that she recently moved there and has quickly built up a criminal empire, along with a letter from her father about his concern over her choice of career, as well as her reply letter. She appears to simply be a bandit leader with an unusually detailed back-story, and she attacks on sight. While Rigel Strong-Arm resides in a quest-related dungeon and is hostile, it is not necessary to kill her to complete the associated quest. This page was last modified on 3 September 2018, at 23:15.